↑ Svat Soucek۔ A History of Inner Asia۔ Cambridge University Press۔ صفحہ 179۔ آئی ایس بی این 9780521657044۔ In 1740 Nadir Shah, the new ruler of Iran, crossed the Amu Darya and, accepting the submission of Muhammad Hakim Bi which was then formalized by the acquiescence of Abulfayz Khan himself, proceeded to attack Khiva. When rebellions broke out in 1743 upon the death of Muhammad Hakim, the shah dispatched the ataliq’s son Muhammad Rahim Bi, who had accompanied him to Iran, to quell them. ↑ Homa Katouzian۔ Iranian History and Politics۔ Routledge۔ صفحہ 128۔ آئی ایس بی این 0-415-29754-0۔ Indeed, since the formation of the Ghaznavids state in the tenth century until the fall of Qajars at the beginning of the twentieth century, most parts of the Iranian cultural regions were ruled by Turkic-speaking dynasties most of the time. 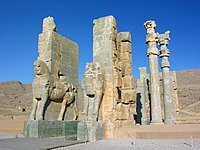 At the same time, the official language was Persian, the court literature was in Persian, and most of the chancellors, ministers, and mandarins were Persian speakers of the highest learning and ability. ↑ "HISTORIOGRAPHY vii. AFSHARID AND ZAND PERIODS – Encyclopaedia Iranica"۔ مورخہ 25 دسمبر 2018 کو اصل سے آرکائیو شدہ۔ Afsharid and Zand court histories largely followed Safavid models in their structure and language, but departed from long-established historiographical conventions in small but meaningful ways.